Harnessing the power of the mind-body connection to promote school success. The mind-body connection means that you can learn to use your thoughts to positively influence some of your body’s physical responses, thereby decreasing stress or anxiety. Research has shown that when you imagine an experience, you often have similar mental and physical responses to those you have when the event actually happens. With hundreds of challenging and safe exercises, we encourage you and keep making progress. Pilates Equipment Classes are designed to workout the entire body. In our classes several Pilates equipment (Reformer, tower, stability Chair) and props may be combined to provide strength training and allows for more exercise options and fluid transitions, ensuring the workouts are never the same, guaranteeing to keep your body guessing and making the absolute most of every session. Maximum of eight students per class. This is a great place to start! For people who are new to the studio, or who have never done Pilates, This 55 minute class is designed to teach you how to use the equipment correctly and safely, as well as prepare you for our open level classes. While the pace & difficulty level of this class are slightly toned down, you can still expect an intense, form-focused workout combining Pilates with strength training, and high energy music to keep your heart pumping… so be prepared to sweat! Reformer 2 workout takes you to a whole new level. Our 55-minute class combines strength training and body awareness that will keep your heart pumping throughout. Our method allows for more exercise options and quicker transitions. Expect an intense fast-paced total body workout that will not only sculpt & tone long lean muscles, but will improve endurance, stamina, balance, alignment and of course core strength. We believe that a strong mind/body connection leads not only to faster and superior results, but overall muscular balance, health and an improved quality of life. 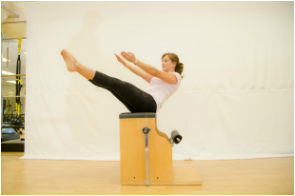 The Freestyle Pilates is design to allow students to practice on all the apparatus and equipment at their own leisure. Students are required to take a sufficient number of private and group classes to ensure they are knowledgeable and disciplined in their practice. Staff assisted. Work at your own pace, improve your technique. Prepare for your Pilates teacher training! This is a contemporary form of reformer class taking the workout back to it’s foundation. Still an intense total body workout, this transition form of Pilates allows for even more emphasis on breath, form, alignment, balance, flexibility and core engagement. Look forward to beginner as well an introduction to intermediate reformer exercises like footwork, the one hundred, elephant, rowing, frog, short spine and more. This class is perfect to mix into your routine if you are just starting your Pilates journey or looking to perfect your alignment and form. This is our most advanced class for experienced students looking to take their workout to the extreme. Expect your strength, balance and endurance to be put to the test with advanced sequencing, higher resistance, balance challenges and even tighter transitions, all leading to the ultimate muscle quivering total body workout. This class is for clients who have a strong grasp of the Pilates Method workout and have taken at least 15 to 20 group classes. Unique class designed to give you the best of to suspension training, and form-focused Pilates. Powerful workout for anyone who wants to intensify the routine. Using your own bodyweight as resistance to challenges every muscle during TRX segments and Pilates Core training. it is efficient, highly effective and will develop balance and core strength as well as increase endurance and stamina. 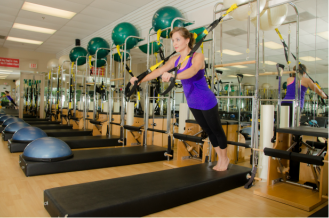 Since your bodyweight creates the resistance, Pilates/TRX is designed with the ability to modify or advance any exercise. A total body workout unlike any other!